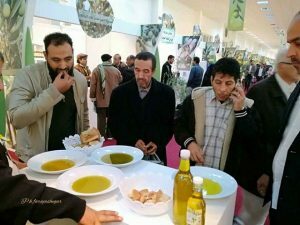 A trade show of Libya olives and olive oil has opened at the Tripoli International Fair ground. Libyan olive oil is highly appreciated by those who know it. However, it is not widely available. As with the orange industry, Libya’s largest export earner before the discovery of oil, the olive oil industry was effectively destroyed during the Qaddafi era. The regime decided that it was easier to import olive oil from Tunisia and Spain. As a result, despite the quality, there is no proper grading or marketing. Most is said to be bought by Tunisian dealers. The rest is usually sold by the side of the road in unmarked plastic bottles. As an indication of the lack of continuing state interest in the business, it is reported that there were no ministers or top officials at today’s opening.